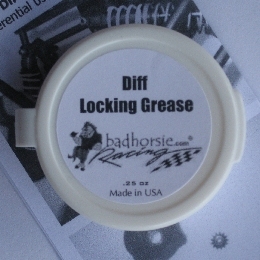 Bad Horsie Diff Locking Grease More traction! Better control! Only the stickiest grease on the planet would be an ideal alternative to "spooling" your RC truck for off-road use. Bad Horsie Diff Locking Grease is that sticky! In fact, you will not find another grease stickier than this! Even the heaviest automotive grease doesn't come close. Easy to follow instructions are included. (1) tub is enough to do 3 to 4 diffs nicely. For use in all RC cars and trucks under 10 pounds with open diffs such as the Traxxas T-Maxx, HPI Savage or even the short-course race trucks like the Traxxas Slash. For racers, if your vehicle's front-end tends to push too hard during tight cornering, by creating a limited-slip-like feel with our Diff Locking Grease you can then learn to power through corners while everyone else has to slow down and brake. For the hill-climbing enthusiast, by applying Diff Locking Grease to the front and rear differentials you will see less wheel spin and hugely improved crawling ability. This is not a lube or silicone, it is in fact a grease so you do not have to worry about it running or seeping out. See our Product Tips for online instructions.